By the time you have reached your seventies, your teeth are tired. Even with proper care and regular trips to the dentist, your teeth and gums have gone through a lifetime of wear and tear. Teeth can withstand this wear and tear if they have received proper care and treatment throughout their life, but for the generation currently in the age range of 65 to 85, their teeth likely didn’t receive the best attention. These people grew up in a time where teeth were less important and where affording dentistry was a difficulty that often could not be managed. Due to the lack of access to good dental care, many older adults suffer from numerous oral health problems. These problems cause them pain, and irritation in their day-to-day life. Many seniors are unable to chew foods that they used to eat with ease, and many suffer other restrictions because of their dentures. The sad truth, however, is that once these elderly adults enter into nursing homes, their teeth become even more neglected. 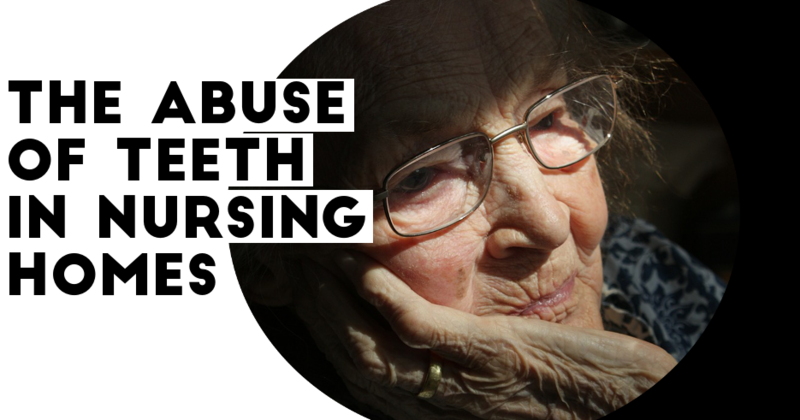 A recent New York Times article relayed the horrors of dentistry in nursing homes. Because nursing home caretakers have many patients to look after, and because more pressing problems arise regarding overall health, oral health is often left to the wayside. Teeth are often left not brushed and dental issues are ignored until the last minute. Some residents have had such severe oral issues that it has caused eating problems. The best way to combat this issue is to advocate for your loved ones. If they can leave for the day, take them to lunch and to a dentist appointment afterwards. Or try to cultivate a relationship with one of their regular caretakers who can account for their brushing needs. Try to schedule them regular appointments and keep track of what is happing with their oral health and their overall health. Switching to an electric toothbrush could be a great investment for your teeth. While a manual toothbrush does a fine job, an electric toothbrush really kicks things up a notch. While a manual toothbrush can struggle to get in-between teeth, around back teeth, and in other hard to reach areas, an electric toothbrush can do it with ease. So what is it that makes an electric toothbrush so great? Well, for starters the round head of an electric toothbrush is designed to adapt to each individual tooth and clean deep between teeth. It also means easier navigation around your mouth and in those tough spots where plaque can build up. Another great feature of an electronic toothbrush is that it pulsates. The pulsating head loosens plaque and then oscillates and rotates to sweep the plaque away. This makes it much easier to remove plaque, which is the biggest culprit in decay. If it wasn’t enough that it is an ideal remover of plaque and easy to use, it also comes with a two-minute timer that stops when you should be done. This is a great feature because it keeps you brushing the entire time. This timer is designed to give you time to brush every inch of your mouth and to do a good job. Ask your dentist if an electric toothbrush is right for you. Why Do Some Healthy Foods Cause Tooth Decay? One British mother was very unhappy when her five-year-old son needed a tooth pulled. Like many parents, she didn’t give her son soda or fruit juice often and couldn’t understand how his teeth had gotten so bad. After asking her dentist, it turned out that the culprit was a healthy food. It was dried fruit like raisins, and dried apricots that were causing the problem. Dried fruits are considered healthy foods, but can be very harmful to teeth. Because dried fruits are sticky, it is hard to remove them from the grooves and pits of teeth. If bits of dried fruit are trapped in teeth for too long, they decay and the sugar turns to acid on the teeth. This acid feeds bacteria and helps destroy teeth. Many healthy foods like fruits are high in acid, which can cause damage to teeth. Eating in moderation and drinking water or chewing gum after eating can help wash away some of those acids. As you can see, even healthy foods can contribute to oral health problems if proper brushing and flossing aren’t maintained. Next time you give your child a handful of raisins, remember that they need to brush and floss afterward so that the sticky bits of dried fruit don’t cause problems with their teeth. Talk to your dentist about more healthy foods that could be harming your teeth and how to combat against tooth decay.